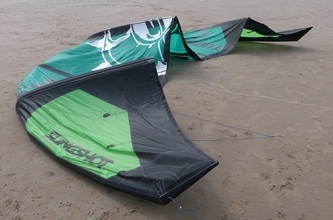 This kite is a monster, even larger than the 2011 edition. 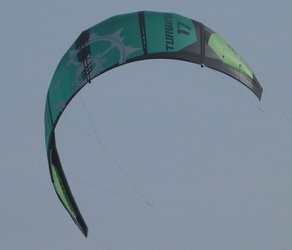 It's still a 17m kite, but its of a considerably higher aspect ratio, giving the kite a longer leading edge. 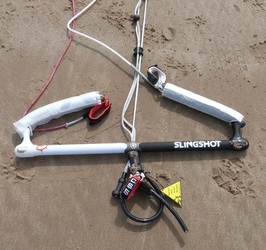 All pulleys are now gone - there's a small bridle for the front line connection and a direct connect to the rear of the kite. The Turbine also comes with 3 removable battens on each wingtip, which can be inserted to prevent canopy flapping in that area. 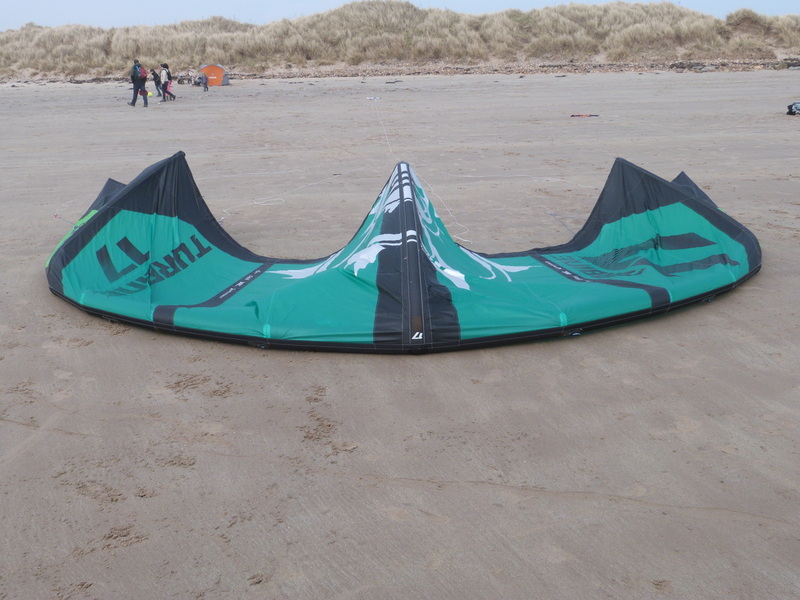 The bar, lines, and general construction of the kite are up to Slingshot's very high standards - no skimping on reinforcement in any of the critical areas, which is great to see as it's likely to be a kite you'll get a lot of use out of! The bar is very similar to anyone familiar with the Slingshot range and is identical to those used on the Rally. It is a weighty alloy bar with rubberised grip, 23" in length with 27m of standard heavy-duty flying lines. It has a small chicken loop and the usual below-the-bar clam cleat sheeting system. The 2013 version has a coated centre hole to reduce line wear and make the below the bar depower a little easier to use, a two-tone colour scheme, and extended velcro sections on the OSR handles to help keep your lines neat and tidy when packing away. It takes very little effort to get up and going on the Turbine, just dive the kite and you're off, and once moving the kite can be parked in the sky, at which point it'll simply just keep on pulling! It's at its very best when you pair it with an efficient board, which will allow its performance to really shine, yet with regular high rockered TT's it'll still get you out on the water well before rest! It flies pretty far forward in the window which aids getting upwind and feels very solid and stable in the sky, which is further improved by the excellent bar feel and feedback. Due to its size its not the most nimble of kites, but can be made to turn pretty swiftly with exaggerated movements of the bar. The kite is very good to jump with, and very floaty indeed, but your timing needs considerable readjustment to account for its sheer size and line length. 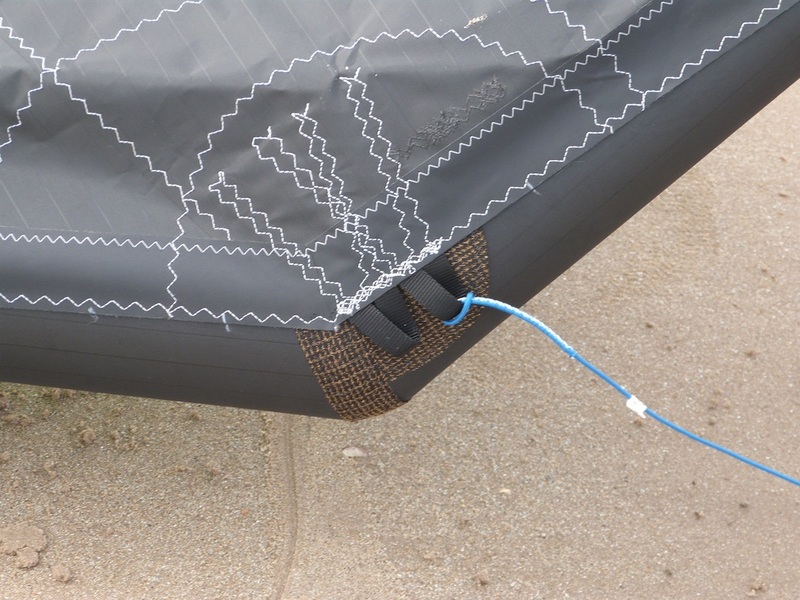 The large sweep on the leading edge also means that should you get it wet, it'll be back up again before too long - a really important aspect of light wind kites - which inspires confidence. Slingshot have improved significantly since the original Turbine - a great, robust, user-friendly kite for getting more time out on the water. It opens up light-wind flying to a much wider audience and is a very good performer in all disciplines and a real head turner on the beach and in the air! 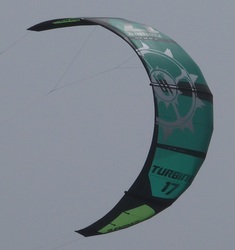 It comes well reinforced and truely is a lightwind kite for the masses.